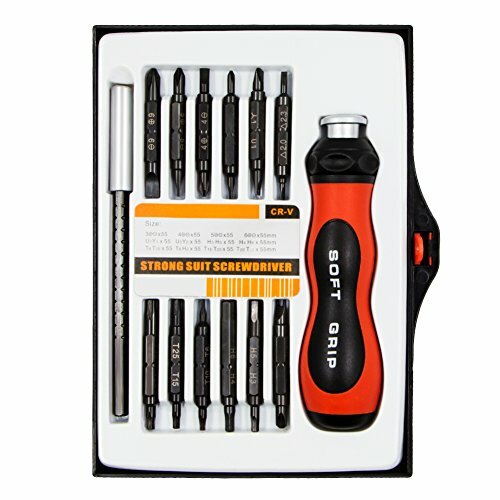 Multi-functional magnetic screwdriver:Special designed screwdriver set is perfect for reparing majority modern electronics such as various popular laptops, phones,game consoles,watch,macbook,etc...This screwdriver bits with strong magnetism which can catch screws easily. Superior material: Tool rod is made of Chrome Vanadium Steel (CRV) material, which makes our screwdriver hard and durable. Non-slip wide comfortable: Our screwdriver handle designed with odontoid surface for Slip-Resistant, its texture is made of soft PP+TPR to make sure comfortable hand feeling. Guarantee:QM-STVR aims to provide you good quality and best service to our customers,if for any reason you are not satisfied with our tool,kindky contact us immediatedly,we\'ll serve you best services and provide you a reasonable solution. The kit includes the most common needed tips. Extension rod gives an extra length to reach uncomfortable spots.